Cryopen is a state of the art technology that uses extreme cold or cryotherapy to safely and painlessly treat superficial harmless skin lesions such as skin tags, warts, veruccas, age spots and sun spots. 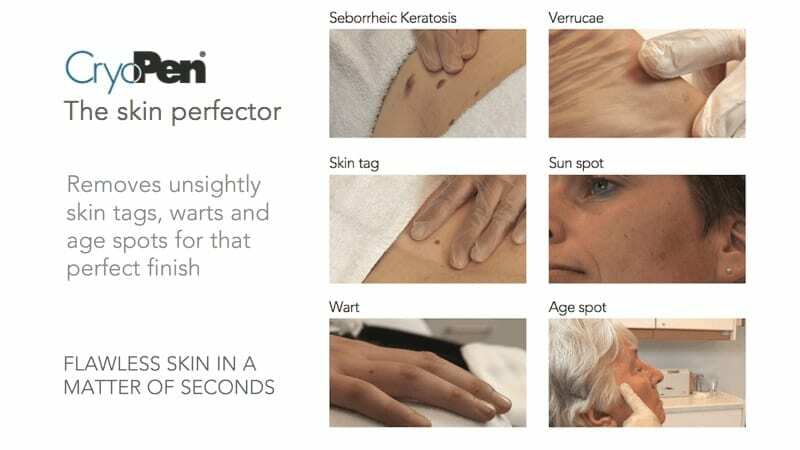 Skyn Doctor clinic Huddersfield is delighted to have acquired this technology in response to popular demand to treat harmless skin lesions in a safe, effective manner. Cryopen uses extreme cold to destroy tissues. The process is called cryo-necrosis, tissue destruction by freezing. During the procedure the pen is held close to the skin and application of nitrous gas oxide gas is ejected under high pressure. During the application, the tip of the cryopen can reach upto -89C. This has the effect of crystallising the fluid content of the targeted cells, resulting in the destruction of the skin lesions as the membrane surrounding the treated cells is destroyed and ruptured. What types of skin conditions can be treated using the Cryopen? Skin tags, warts, age spots, verruca’s, milia, cherry angiomas and other benign skin perfections. Interested? Book in for a consultation and arrange for one of our skyn doctors to assess your skin lesion so we can decide a safe, tailored treatment plan.